The Haws 1001HPS Drinking Fountain is a wall mounted barrier-free unit. Shall include an 18 gauge Type 304 high-polished stainless steel finish basin with integral swirl design, 14 gauge Type 304 high-polished stainless steel wall bracket, push-button operated valve with front-accessible cartridge and flow adjustment, polished chrome-plated brass vandal-resistant bubbler head with integral laminar anti-squirt flow, chrome-plated brass vandal-resistant waste strainer, vandal-resistant bottom plate, and 1-1/4" O.D. waste pipe. (P-trap and stop require rear access). Perfect for either public or private indoor/outdoor settings, Model 1001HPS is a great fit in areas where aesthetics are important to the overall appeal of the architecture. This series is precisely mounted, making it a nice addition to any surrounding. Beautiful high-polished finish helps to maintain the fountains overall appeal so it always remains looking as new as it did when it was installed. Specifically, this type of wall mounted drinking fountain may be placed in settings such as: schools and other locations in and around office buildings where the temperature remains above freezing. 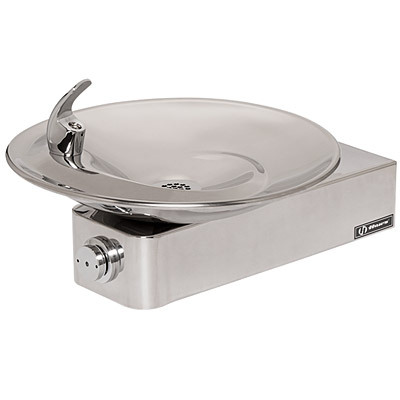 18 gauge Type 304 Stainless Steel fountain with attractive and functional swirl bowl design, along with a vandal-resistant bottom plate provides a long lasting unit with added peace of mind. 3/16" steel mounting plate with supplied mounting hardware provides a solid unit base and allows for easy installation to a framed wall. (P-trap and stop require rear access). Haws Part# 6700 - Steel in-wall mounting plate. Model 6603HPS, high polished stainless steel access panel. Includes frame and screws..
Model HCR8, 8 gph remote water chiller provides instantaneous cooling to meet a continuous demand for chilled water.